The victim, believed to be in his early 20s, was found with stab wounds in Cunningham Place, near Regent's Park, at 18:15 GMT, and died in hospital. The Metropolitan Police said a search of the nearby London Central Mosque, which was sealed off by armed officers, was linked to the attack. A spokeswoman said officers continued to hunt for the suspects who had "fled the scene". Bahir Moulana said he saw two people being detained and put in handcuffs by police at the mosque. "The police just surrounded them. I saw that at around 19:00," he added. But the Met said no arrests had been made, and a spokesperson added that the stabbing was not terror-related. Mr Moulana said a woman told him she saw "two guys" enter the building. "Someone else told me the police were chasing them," he added. He said as he was walking towards the mosque the police were pushing people back before they closed the main gate. Mr Moulana, 39, said it gave him the "jitters" to see armed police at the scene, especially following the recent attack at two mosques in New Zealand. "I saw all the blue lights and my heart was in my mouth." Image caption Westminster North MP Karen Buck said she was "deeply saddened"
Police remain at the mosque after officers were seen flanking parts of the building's perimeter as a helicopter circled overhead on Thursday. Westminster North MP Karen Buck said she was "deeply saddened to hear this awful news". London Central Mosque said "all staff and attendees to the Mosque are safe". Friday prayers will go ahead as planned, a spokesman added. 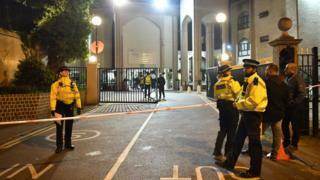 The armed officers could be seen leaving the mosque at about 23:30. Cdr Simon Rose, of the Met Police, thanked mosque attendees "for their patience, cooperation and understanding while officers conducted essential searches of the area in the immediate aftermath of the murder." A crime scene remains in place, but with "a reduced police presence" a Scotland Yard spokesperson said.